Do you want to know what I miss these days? 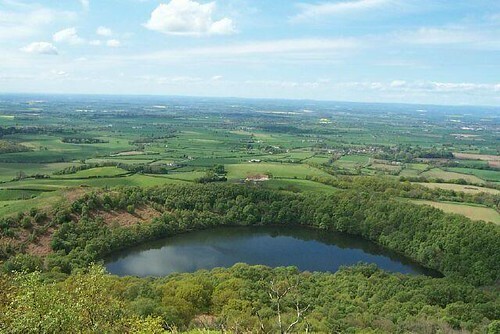 The view (see above) from high atop Sutton Bank in North Yorkshire, England. That’s what. It’s been almost eight years since we last set foot in England. I never, in my wildest dreams, thought we’d go eight years in-between visits there. We had gone as long as three before that, from the time we first visited that enchanted land in 1986, on our honeymoon. After that first visit, we waited three years before going back. Out of necessity, really, not intent. We had just gotten married, bought our first (and only) house, and we needed those early years to attend to domestic issues before returning to the land of our dreams. But in 1989, back we went. To Yorkshire only, this time. Our favourite place on earth. I remember we took another couple (friends) with us that year, too. The four of us drove all around Northern England and a little of Scotland and had a very nice time, indeed. We were on the lookout for the famous vet, James Herriot (Alf Wight) and we spent the entire two weeks looking around – into the faces of elderly gentlemen on trains, in shops, on the street – hoping to get a glimpse of the Man we all admired and loved so much. On the last day of our holiday, a Thursday evening, we had been out all day and were very tired. 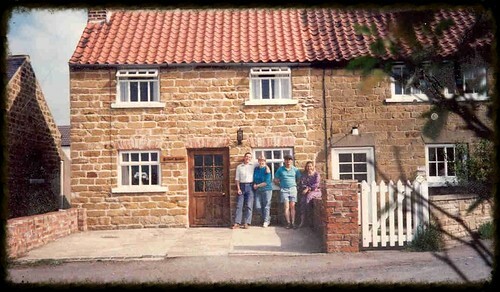 We’d arrived back at our self-catering cottage in Sutton-under-Whitestonecliff (called “Schoolhouse Cottage” – because it was next to the local grammar school, which was a lot of fun in itself – see photo at the end of this page showing us and the cottage). It was still before suppertime, and we were all just resting up, each in our own corner of the cottage, reading things we’d either brought with us or bought out at the shops. I was outside on the cement patio in a lawn chair reading, as it happened, one of my James Herriot books. The others were all inside the cottage. I was alone outside. 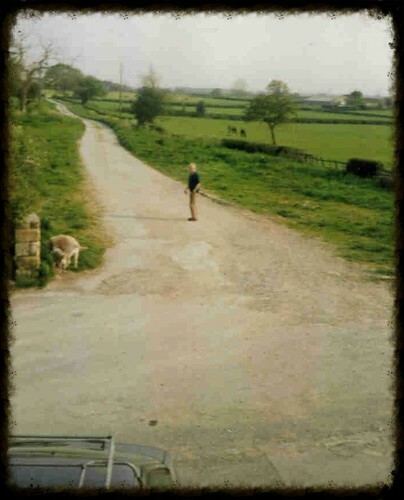 A small car drove up and parked about 10 feet away from me across the small lane and out popped an elderly gentleman, looking for all the world like the James Herriot that we’d grown to know from having the Herriot calendars on our walls every year. He let two dogs out of the car, one little dog that looked very much like his dog Bodie from the calendars, and another dog, a lab I believe. The three of them took a nice stroll down the long farm lane that was across from our cottage and which went on forever into the North Yorkshire farmlands. I ran into the cottage and alerted the others. I looked at a James Herriot book that we had lying around for a photograph of him, just to make sure, and, yes, it was The Man! Outside our cottage! Before he got too far away, I ran upstairs to our bedroom and snapped the picture above out the window, hoping that he wouldn’t see me or hear the camera click! My camera was not a great one. The picture was fuzzy. But I got it. Then I alerted everyone that I thought he was outside, and we all ran outside and seated ourselves around the concrete stoop area, waiting for him to return from his walkies with the dogs. He signed our Herriot books for us. His son lived two doors down from where we were staying, and he was going to dinner there. We were very cool about it all. We didn’t let on to the neighboring tourists to our left (who were also sitting outside having a drink at the end of their day) that it was James Herriot we were all fawning over. They didn’t even know. They never did. We kept mum. But inside we were all bursting our seams. The last day of the trip, we not only saw him but spoke to him and got his autograph. Yes, friends, I am now in my 60s and I know I must sound like a star-crazed teenager. If you only knew the role that man played in bringing Paul and me together in the first place, well, it was just too good for words. Very sadly, he passed away within a few years, and the world is a poorer place with the loss of Dr. Alf Wight. Below is a picture we got our neighbors to snap of the four of us before we left that blessed piece of heaven. Only the day before we had met The Man himself, right there in front of our cottage. I know I’ve probably told this story at least once before in my journal/blog, but sometimes you just need to reiterate the good things in your life, as sort of a pep-talk, when life is particularly hum-drum, as mine seems to be just now. That experience can never be erased from our memories, and it lives there in our hearts to remember as often as we need it. “Star-crazed”, “fawning” and “bursting at the seams” sounds exactly right for this situation. I am very sure I would have had the exact same reaction! Come on, guys, it’s JAMES HERRIOT!! Thanks for sharing this memory. I will be forever jealous. I went to England in the late seventies, and loved it. I remember well sitting on Sutton bank and also riding on the road where it had water going over it . He used that in his movies. What a lovely memory – and with pictures, too. Thanks for sharing this great story and photos.